Select Restoration is a full-service certified Michigan Property Damage Restoration company, Select Restoration is Macomb County’s leading source for Mold Testing, Mold Inspection and Mold Remediation Solutions. Being in the property restoration industry for over 25 years now we know that natural disasters, such as flooding, plumbing issues and roof leaks can lead to harmful Mold Growth. If you smell a musty odor or see Mold Spores in your home or business, it’s time to take action. Improper cleanup of water damage is one of the leading causes of Mold Growth here in Michigan. If you’ve experienced a basement flood, sewer backup, appliance failure, call Select Restoration immediately. Our certified Water Damage Restoration experts will do a complete dry out and cleanup before toxic Mold takes over. Mold Spores require the perfect conditions to grow into a slimy or fuzzy colony. An organic food source, warmth, and, above all else, moisture must be present. As a result, naturally damp spaces such as the attic, crawl space, bathroom, and basement are the most likely places to grow Mold. Preventing Mold Damage After a Water Disaster! While some mold is unavoidable, an overgrowth of mold can lead to serious issues. Left untreated, mold can be a dangerous air pollutant that spreads quickly to other areas of your home. To find out if you need professional remediation of your mold issue call us today. We are certified through IICRC and NAMP to provide professional mold remediation and removal services here in Michigan. MOLD REMEDIATION MICHIGAN, HOW DO I KNOW IF MY HOME NEEDS IT? If you notice any of these signs of Mold Growth in your home or business, contact Select Restoration Restoration at 586-791-3900 as soon as possible to begin remediation. The certified team at Select Restoration is certified by the Institute of Inspection Cleaning and Restoration Certification (IICRC) to perform Water Damage Restoration and Mold Remediation. Here are a few steps you can take to clean up Mold before the professionals arrive, but for your safety, let us do the brunt of the work. Identify the extent of the water and Mold problem – We send a professional microbiologist to your property to determine where the mold is growing, what type of mold it is, and how widespread the problem has become. Contain the mold – We isolate the affected area to avoid contaminating the rest of your home during the treatment process. Filter the air – Our team runs air cleaners with HEPA filters to rid the air of mold spores intent on landing, growing, and exacerbating the problem. Remove mold from walls, ceilings, floors, and ductwork – Because mold penetrates surfaces as deeply as possible, it’s best to dispose of any moldy porous materials, including carpet, carpet padding, ceiling tiles, insulation, and drywall. Nonporous and semi-porous materials such as metal, glass, hard plastic, concrete, and wood are often salvageable using antimicrobial cleaners and sealants. 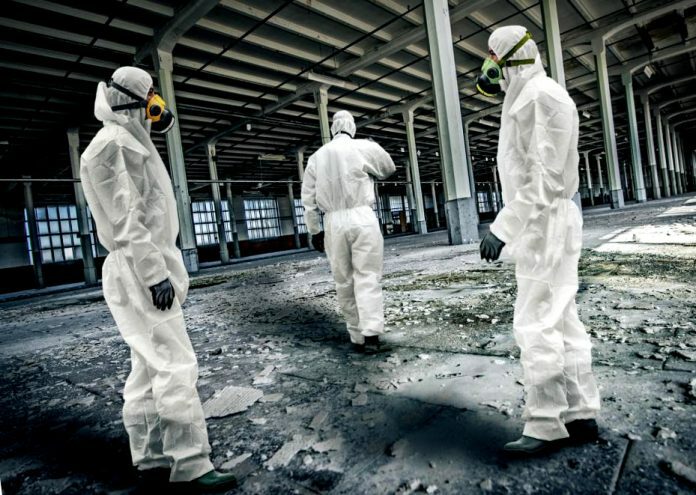 Restore mold-infested belongings – We take the contaminated contents of your building to our climate-controlled storage facility for mold treatment, deodorization, and drying. We use state-of-the-art content restoration techniques to recover as many of your possessions as possible. Prevent mold regeneration – After cleaning up existing mold, it’s vital to address the source of the moisture that caused the mold growth in the first place. We identify that source and devise a plan of action to ensure the mold doesn’t return.